Windy. Cloudy skies will become partly cloudy this afternoon. Slight chance of a rain shower. High around 45F. Winds N at 20 to 30 mph.. Follow Times staff and Valparaiso University fans as they comment on the announcement of the NCAA Tournament pairings, which will include the Horizon League champion Crusaders. Looks like @jppalmCBS and I are on the same level with Georgetown and Valparaiso being potential opponents. If he's in, I'm sold. Wisconsin better with Koenig than Jackson and they were good then. North Carolina vs. Harvard. Academic fraud vs. Academics. Baylor vs Georgia State. Scott Drew vs. Ron Hunter. Alec Peters said he reads my tweets more than I'd think. Hi Alec. I guess wearing my 2013 NCAA tournament shirt brought @ValpoBasketball the luck of coming to my home in #columbus for their game! 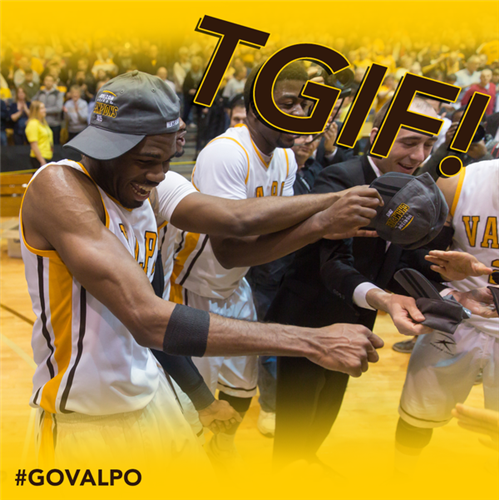 #GoValpo ???? Hey Valpo, my birthday is this weekend. I see @YahooForde has Valparaiso as a "Bracket Wrecker" and Maryland as a "Fradulent Five." Pretty sure we know what that means. Just got followed by @CoachChrissyLou. See that she's a self-proclaimed West Wing Freak. This could be beginning of beautiful Twittership.